The Apache Trail consists of 40 miles of rugged scenery with reservoirs, lakes, desert and mountains. The road goes through the Superstition Mountains and the city of Apache Junction Arizona sits at the junction. This part of the world is an ideal location for a movie and it features in Raising Arizona, starring Nicholas Cage and Holly Hunter. There are a few lost mines stories across America and the area around Apache Junction Arizona features in one of them. 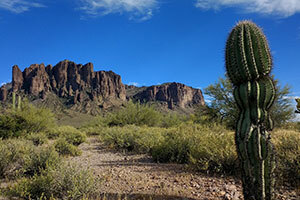 The legend of the Lost Dutchman’s Gold Mine is part of local folklore. Some people think that it is just a story but others are convinced of its existence. The story goes that a gold mine is somewhere in the Superstition Mountains and people have been searching for it since 1892. The land is officially wilderness and mining is not allowed now. One of the most colorful versions of the legend says that Apache Indians mined the gold under the leadership of Chief Geronimo. The Arizona Renaissance Festival is an annual event that runs from late winter until mid spring. Apache Junction Arizona is the nearest town to the popular gathering. It’s a family attraction with a medieval amusement park and Renaissance Fair. There is a theatre, circus, a feast and an arts and crafts market. The crowds are taken back to medieval times with jousting tournaments and the children love the petting zoo. Live music performances are organized and there are plenty of food vendors. The natural history of the desert is presented at the Boyce Thompson Arboretum, where visitors can join guided tours and enjoy a picnic or cook on charcoal grills. There is an art gallery and a series of specialist gardens that include desert plants, a cactus garden, herb garden and a eucalyptus forest. It’s a great place to relax in the scented rose garden and hummingbird and butterfly garden. The animal population is typical of animals found in the Apache Junction Arizona region and includes lizards, squirrels and there are many species of birds, including birds of prey. For entertainment, Barleen’s Arizona Opry provides dinner theatre and live music shows for every holiday. There are special Christmas and New Year’s Eve shows and shows for Valentine’s Day and St.Patrick’s Day. A turkey dinner is served at the regular Thanksgiving Day matinee. The families in the area are fortunate in having the facilities at Prospector Park. The park enables the citizens of Apache Junction Arizona to play soccer, racquetball, tennis, basketball and volleyball. There are picnic areas and playgrounds and hiking and horseback trails.